So what exactly is a Vmedia disc? Well, it's pretty much the worst idea ever. Vmedia believes that their 1GB mini optical disc (promised to hit 2GB if you just give them enough time), is worth a piece of the space and price in your next netbook. A Vmedia disc has many advantages over flash storage, the company claims. 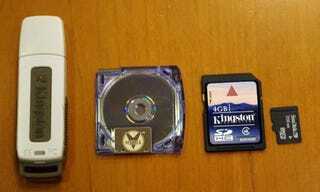 For instance, when you stick an SD card in a computer, its video content may or may not play correctly. Vmedia will offer a codec standard, like DVD, allowing them to license the technology to Hollywood. Vmedia also claims that their discs are cheaper to produce than flash storage. That's probably true, but it's not a savings that would ever be passed on to the consumer. It's just to entice content providers into adopting the tech. You know, so they can sell you Spiderman 3 on yet another format with low risk.